Heesen 42.4-metre superyacht Alive has completed her sea trials. The vessel, which boasts a steel hull and aluminium superstructure, reached an impressive top speed of 16.4 knots, exceeding the contractual speed by 0.5 knots, according to Heesen. Conditions were slight with a sea state of 70cm and 3-4 SW winds. The contractual fuel consumption prediction proved to be correct – 4,000 nautical miles at 12 knots. More than 750 miles of this comes free of charge, claims the yard, thanks to the boat's frugal fuel consumption, which is said to be 30 per cent less than on a conventional displacement yacht. Heesen were especially excited with the speed tests because Alive is the first luxury vessel from the Oss manufacturer equipped with new Dutch design Hull Vane. A fixed foil beneath the boat's stern, Hull Vane influences the stern wave pattern and creates hydrodynamic lift, reducing resistance through the water. Van Oossanen Naval Architects worked with Heesen on the boat's naval architecture, while Omega Architects took care of the interior and exterior styling. With a nine-metre beam, Alive, which was launched in September, weighs 54 tons at half load and with twin MTU 12V M72 engines has a 4,000 mile range at 12 knots. She can sleep 12 and carries 10 crew including the captain. 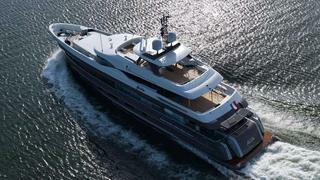 Superyacht Alive was delivered to her owners on November 4.